After gaining professional experience in various fields, such as hotel or office building maintenance, one evening in 2010 I thought it was time I did something “for myself”. Although it was a less favourable period to start a business, given the fact that many firms were closing down because they were “unprofitable”, I said to myself, however, that it was a good time to set up a professional cleaning services firm in Bucharest, a field which I perceived as having a good growth potential in time. Yes, I admit it, I am a young entrepreneur and I am part of that 1% of Romanian young people who go into business in Romania with the belief that passion, perseverance and the permanent desire of development can be the ingredients of success. And yes, after more than 5 years, I have learnt that long-lasting business relationships are built in time, that, although quite a lot of effort and resources are needed to gain clients, constant care and attention are also necessary to keep them. The market has evolved in comparison with the time of our start-up, the benefits of “delegating” the cleaning services to a specialized firm are finally appreciated and demanded but, from my point of view, the criteria which really make the difference in this field are still reliability, attention to details, responsibility, flexibility, honesty. If you are the manager or the owner of a company with more than 50 employees and you have to pay a disability fund to the state monthly, by acquiring our services you are offered tax deductibility because the firm Piontani Cleaning Services is registered as Protected Unit in compliance with the republished Law 448/2006 regarding the protection and promotion of the rights of the persons with disabilities. 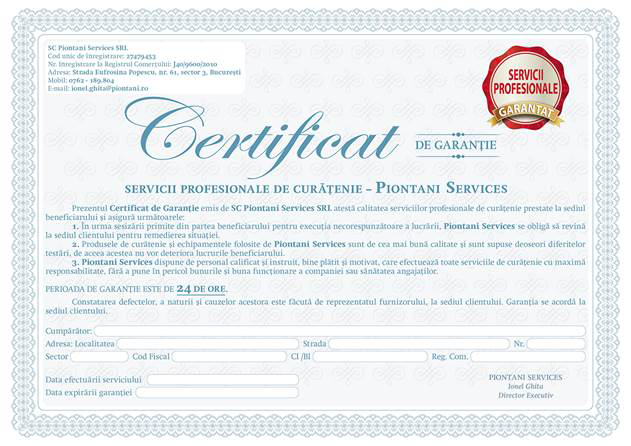 The mission of Piontani Cleaning Services aims at being for each of its clients, regardless of their requests and budget, the professional cleaning team with the highest degree of honesty, dedication, confidence and attention to details, offering a pleasant experience every time it works with its partners and develops an environment of constant growth for its employees. We want to be that professional cleaning firm which is constantly present on the short list of all the managers and business owners in Romania in search of both a supplier and a partner willing to make the necessary effort to earn their trust and to develop a long-term business relationship. We want to become the professional cleaning firm preferred by its employees for its dedication, respect and desire to do things better. Respect: we invest time in understanding our employees, clients, business partners and we respect their choices. Responsibility: we take responsibility for our actions, in front of both our employees and our clients, being at the same time open to supporting the community in social projects. Care: we pay attention to our employees and clients, and especially to those who want to regain their dignity through work. Honesty: An old Latin saying, attributable to Seneca, tells us that “to err is human, to persist is devilish”. We take responsibility for possible slips or mistakes and we are always open to progress and to create new standards of quality. A thorough and lasting cleaning is not only the result of the work of some experienced people, but also of people keen on doing their job well. Piontani Cleaning Services comes to your help with a qualified team, with people having the necessary experience and training in offering professional cleaning and maintenance services for a variety of areas such as office buildings, commercial areas, schools, kindergartens, medical offices, fairs and exhibitions or public institutions. Also, the Piontani professionals are specialized in cleaning and polishing noble surfaces, such as marble.. In June 2004 Piontani Cleaning Services opened a second work point in London, targeting with its professional cleaning services both the residential and commercial market. in the field of activities specialized in cleaning services. 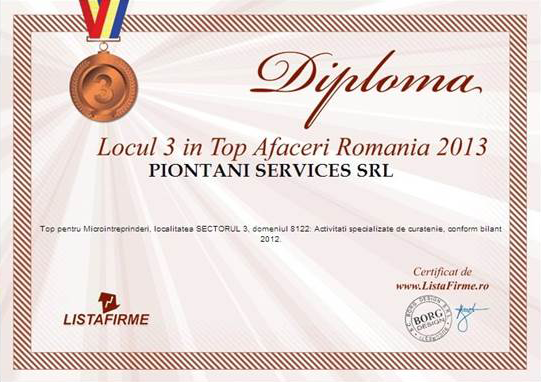 This symbolic recognition of the professionalism and performance of the Piontani Cleaning Services team motivates us and obliges us to rise to the level of our clients’ expectations and to go beyond our own standards. We take responsibility for the quality of the cleaning services performed and this is why we offer to all our clients a Certificate of Guarantee valid for 24 hours via which we attest the quality of the products and equipment used, the staff qualification. At the same time, Piontani Services binds itself to remedy in the shortest period of time the possible slips or even damages referred to by the clients.